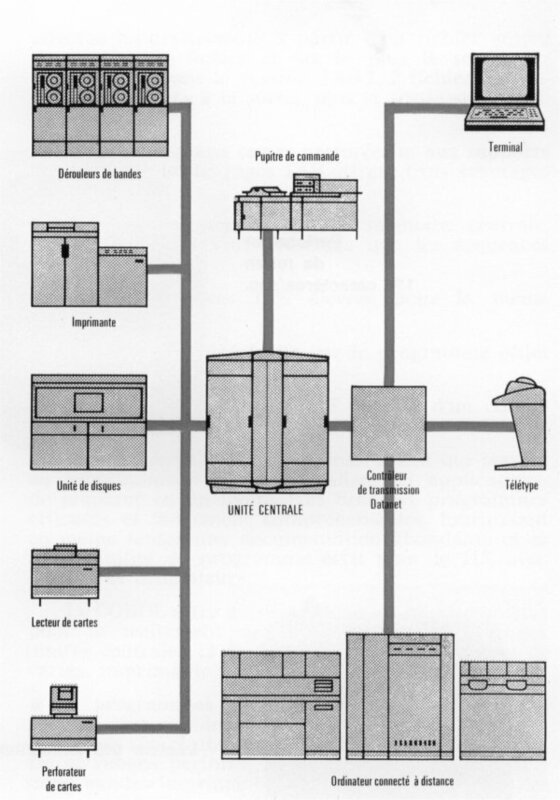 Les GE-400 furent le premier système rigoureusement planifié par General Electric au début des années 1960 pour une introduction dans le marché des ordinateurs universels. Développé sous le nom de code Mosaic, il devait comprendre trois modèles (dont le plus puissant sera abandonné au profit du GE-600). Il fut conçu et construit par le Computer Equipment Department à Phoenix, Arizona. A partir de 1965, il fut aussi construit dans l'usine d'Angers de Bull-GE. Le succès du GE-400 fut relativement plus important en Europe qu'aux États-Unis. On trouvera sur une page séparée une documentation succincte sur quelque clients. The GE-400 was the first system designed by General Electric that was thoroughly planned for the general purpose market in the early 1960s. Developed under the code name Mosaic It should have included three models (the upper model being eventually cancelled and replaced by the GE-600). It was designed and manufactured by the Computer Equipment Department in Phoenix AZ. In 1965, manufacturing took also place in Bull-GE's plant in Angers, France. The GE-400 was substituted in the Bull-GE's offer to the RCA-licensed Bull Gamma 30 and to its expected successors. In 1968, Bull substituted an entry model of GE-400 (GE-415) to its GE-140. 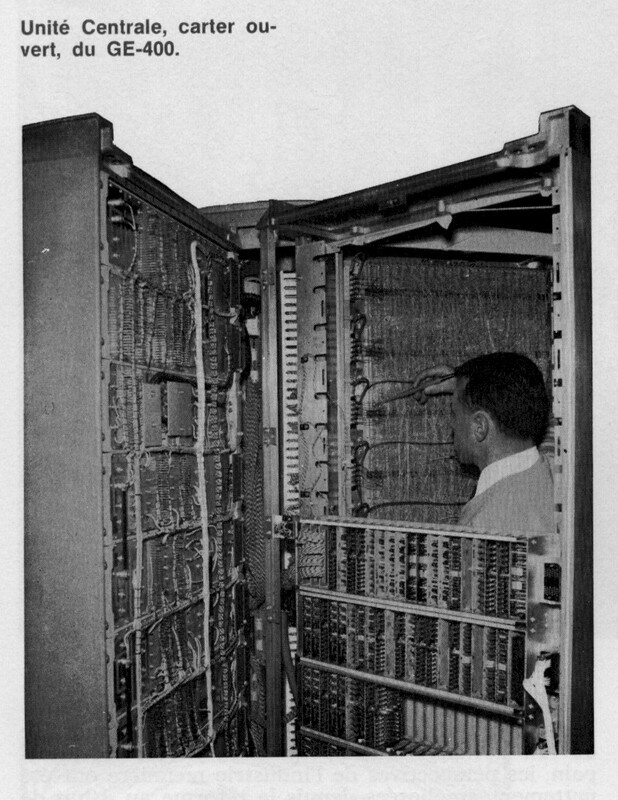 The GE-400 used 24-bits words storing binary words, 4 BCD characters or 4 decimal digits (signed). Instructions are 24-bits length. Instructions have one or two addresses. There was 6 index-registers (located in lower main memory). In addition to indexation, GE-400 had indirect addressing. The architecture assumes programs to be self modifiable. The GE-400 architecture addresses a 96-bits relocatable Accumulator (sometimes named Flying accumulator) and located in main memory. A sophisticated EDT instruction ease the formatting of data with a format definition located in the relocatable Accumulator. The CPI I/O Channels provided a capability of data chaining known as scatter/gather facility that reduce the amount of memory to memory Moves. The GE-400 architecture was using a 24-bits word, and BCD 6-bits characters. No SMP (multiprocessor) provision exist or were planned in the architecture and its implementation. The processor was available as two versions: GE-425 and GE-435, differing by the cycle time and addressing capabilities. A floating-point hardware option was available for the few scientific users. one of the memory blocks received a modified addressing scheme for 1401 program and data. It was activated under operator control through switches. 1401 instructions were interpreted by software. The GE-400 processor was significantly more powerful than the original 1401 and performances were satisfactory. GE tapes had difficulties to process IBM tapes due to their lower tolerance to media defects. Overall, the penetration of the 1401 park by GE-400 was significantly inferior to that of the cheaper Honeywell H-200. The main memory was using magnetic core technology and had a size reaching 128K words (equivalent to 524288 characters). The input/output devices (unit record equipment, tapes and discs) were connected to the central memory through standards CPI (Common Peripheral Interface) 6-bits wide parallel channels. The same peripheral were used on GE-400 and the GE-600 product lines. The main disc unit was the bulky DS-30, also used on GE-265 and GE-625. Data communications applications, mainly remote batch, were supported through a Datanet-30 front-end processor. Bull-General Electric developed a few specials for the GE-400, noticeably the connection of RCA-developed magnetic card based mass memory system , sold by Bull as the Bullrac. It could be also remember that the Compagnie des Machines Bull LP300 a reader/punch at 300 cards per minute (the fastest card punch ever built) had been selected as a card device by GE even before the GE-Bull merger. Magnetic Tapes 200-556-800 cpi, 20 to 120 Kcps. Single or dual channels controllers supporting up to 16 tape drives. Magnetic Disks up to 4 units of 23.5 Mc per unit. Data are stored on 240 characters blocks. Mean access time is 199 ms. Transfer rate varies from 41.7 Kcps (internal tracks) to 83.4 Kcps (external tracks). Magnetic Documents reader/sorter 1200 doc per minute, with 12 sorting pockets. Datanets adapters used under the control of GE-400 software. Datanet-30 an autonomus communication computer. BIOS allows I/O interrupt handling, console typewriter control, device channel independence for programs, and a sequential monitor. EIOS added to BIOS logical records processing, buffering of physical records, checkpoints, label processing. Those functions were implemented as subroutines loaded with the application programs. TPS was rarely used in Europe, where the majority of customers us the batch DPS system. DPS was functionally equivalent to TPS, but had the advantage of reducing the opertaing constraints of an all-tape system. One of the original goal of DPS was to support GE-400 disc only systems, without tapes. However that part of the program, involving Bull-General Electric participation, was eventually discontinued. DAPS is the most advanced software system running on GE-400. The goal of that operating system was to provide , in addition to the processing of sequential files on tapes, discs the processing of "random access" files on discs and mass storage. DAPS require the DAP hardware feature. Targeting the support of relatively slow data communication lines required an efficient multiprogramming feature. Multiprogramming was well assisted by the asynchronous operation of the CPI channels and their system of interrupts. DAPS supported up to 4 (four) simultaneously executing independent programs, each having the maximum size of 32K words, plus card-to-disc program-spooling and disc-to-printer and remote-printer spooling of results. The address space of programs was limited to the allocated quota of real memory. Complex business programs relied on the, then familiar, overlay mechanism for programs and temporary files for data. Telecommunications operation was generally using a resident application programs either completing all the process or communicating with other programs through disc files. DAPS was probably too ambitious for the GE-400 architecture and hardware. In Europe, its users were the Police administration in Paris and Oslo, Michelin, the insurances company SAMDA and the Austrian ministry of Finances. In 1966-1968, Bull-General Electric developed in collaboration with ACT i a transactional subsystem on the GE-400. It was based on an analysis of the banking industry needs for on-line processing of customers accounts. OLBS was at the origin of TDS that was later developed by Honeywell-Bull on GCOS66 and eventually upgraded as DMIV-TP on GCOS8. COBOL 61 (augmented by COBOL 65 features) supporting direct access organizations. IDS/COBOL Integrated Data Store, invented by GE's Charles Bachmann, a predecessor of CODASYL organizations supported through a COBOL macro preprocessor. GE-400 DAPS applications were able to use an extensive library of service subroutines, including a math package and a comprehensive system of checkpoint and restart. The GE-400 encounters a limited success in United States, where General Electric customers were more oriented to acquire more powerful GE-600 line. It was very successful in many European countries, where it was actively marketed by Bull-General Electric, GE Information Systems Italia and GEIS, Ltd United Kingdom. The park was several hundreds of systems. 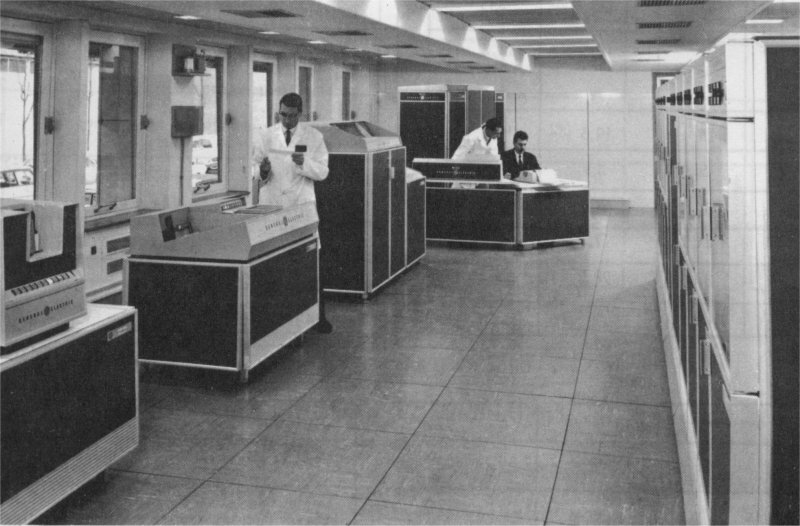 The buy-out by Honeywell of GE computer assets in 1970 stopped the distribution of GE-400, the developments of which having already suspended in Phoenix since 1967. The replacement was initially the Honeywell 3200, but the GE-400 was either evaporating or was converted into the Honeywell Level-66 product line, heir of the GE-600. Conversions were relatively painless because the great majority of applications were written in COBOL and that GCO66 (alias GCOSIII) did include peculiar functions of GE-400 (such as IDS). No emulators of GE-400 was ever developed on Level-66 or other members of Series60. Revision : 06 décembre 2005 .